Lt. Drake is an agent with the U.S. Naval Intelligence. His rank is mentioned above instead of a first name because despite having 25 short adventures told over the course of two years, no first name is ever given. He is referred to as Lieutenant sometimes and as Drake others but never anything else. His given name is not the only thing left unsaid. His entire history is a clean slate. Where he is from, how and why he joined the Navy, what he did to become a lieutenant and how long did it take are all mysteries, as is how he came to be in the Intelligence field. Very little is, in fact, known about Drake. He is male. He is likely in his late 20's or early 30's based on his depiction although he might be younger if one went by his far too often rashness. Drake is quite good looking with blond hair frequently shown to be slightly wavy. He is athletic and remarkably agile, which is good because people are constantly throwing things at him or shooting at him or leaving bombs in his vicinity. He sports usually a pencil-thin mustache which adds to his dashing, almost swashbuckling image. As mentioned, Drake is an intelligence agent. He serves during the years leading up to America's entry into the Second World War with his last recorded adventure taking place four months before the attack on Pearl Harbor. Exactly how long he has been with that branch is not known but it must have been at least a couple of years because his reputation is already established. He obviously likes to work alone because he never has anyone assigned with him and some of the missions are rather dangerous from the outset. It could also be that no one else would work with him because he tends to break through doors not knowing what is behind them and more than once ending up unconscious and ready to be dispatched. 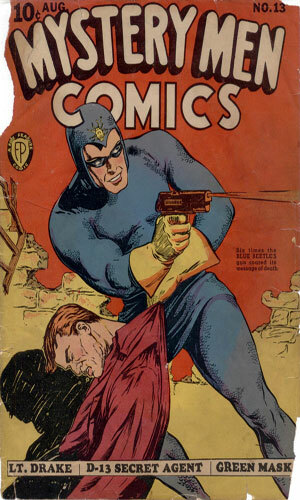 Lt. Drake was one of several different characters that made up the Mystery Men Comics publication during its short history. 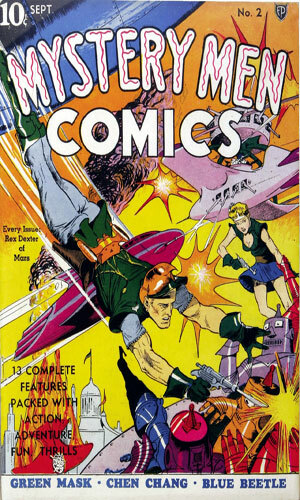 That monthly comicbook was the product of V. S. Fox who started his own company after working at National Publications for a while and seeing the money that was in illustrated adventures. 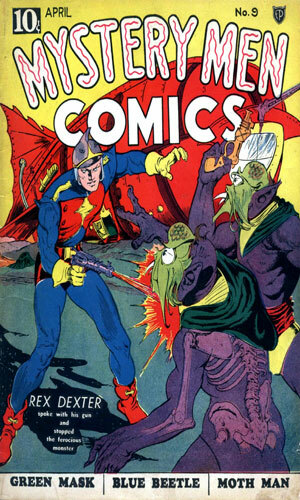 Lt. Drake was, as mentioned, one of the other adventure stories in the publication. 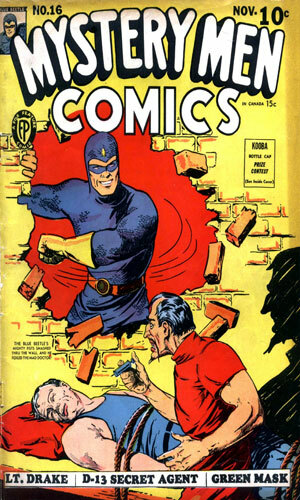 Some came and went quickly but Drake hung on for 25 issues, almost the entire run of the comic. He was never a major player, though. His stories were told in an average of 5 pages (one was 4 and a couple were 6) and they were almost always in the latter half of the issue. 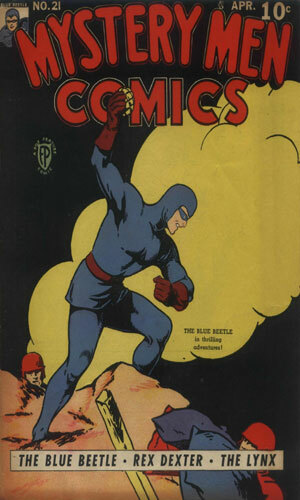 For the first dozen issues the name of the comic was "Lt. Drake of Naval Intelligence". From #13 on, the name was slightly expanded to read "Lt. Drake of U.S. Naval Intelligence". I am not sure if the change was because it was being also sold overseas or if it was just felt a tad bit of national pride was in order. Since the stories ran during the two years of WWII leading up to the entry of the United States into the conflict, the national origins of the "foreign" enemies that Lt. Drake faced were never specifically stated but they had for the most part Germanic accents. Drake did go up against local gangsters on a couple of instances and pirates as well but by and large the principle bad guys were Germans. Of note, though, was at least one case where it was obviously Soviet agents causing trouble (use of the term 'comrade' and very Russian beards). 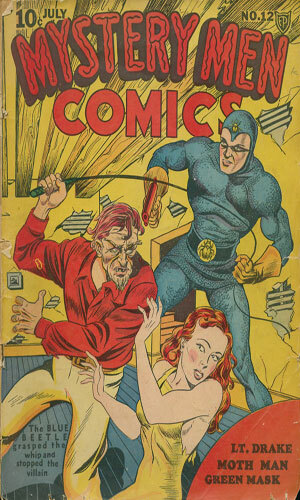 From Mystery Men Comics #1 - Investigating sabotage incidents at sea, Lt. Drake goes undercover on a liner. He must stop enemy agents from stealing diplomatic secrets and scuttling the ship in the Narrows of New York. 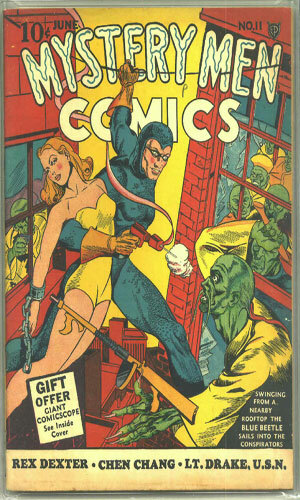 From Mystery Men Comics #2 - The whaler Tanbark is suspected of smuggling aliens into San Francisco and Lt. Drake is sent to prove it. He also stops it. 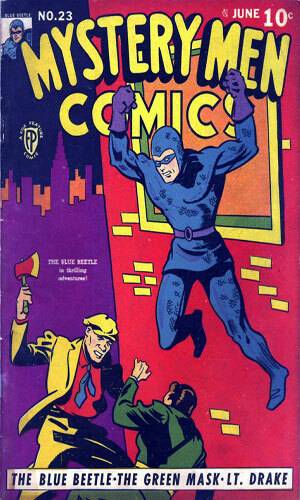 From Mystery Men Comics #3 - A gang of transatlantic gamblers are "mulcting" money from people on an ocean-liner. Lt. Drake's job is to "ferret them out and clean up these human leeches". 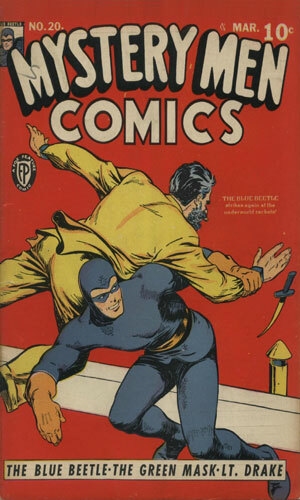 From Mystery Men Comics #4 - "Drake, in the guise of a fisherman, lolls on the tropical waters of the Florida keys, hoping thereby to solve the strange disappearances of local yachts and their owners." 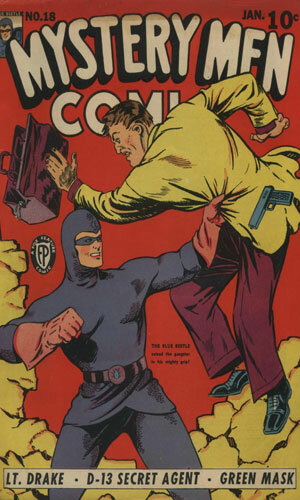 From Mystery Men Comics #5 - Lt. Drake is on the trail of an international dop smuggling ring. From Mystery Men Comics #6 - Drake has been assigned to hunt Tony Brick, poison-ring leader (not sure why the gang was poisoning people). 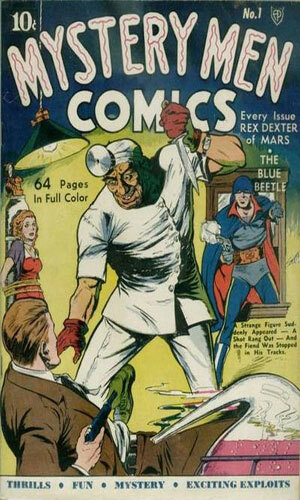 From Mystery Men Comics #7 - Hoodlums have been preying on fishing vessels, stealing their cargo. Drake is assigned to stop them. 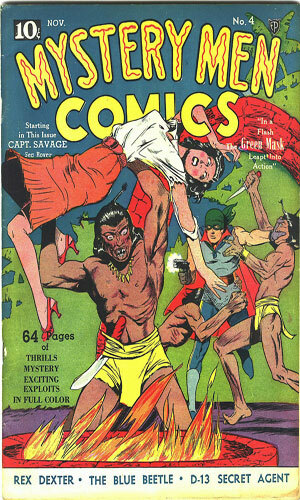 From Mystery Men Comics #8 - Investigating "strong reports of unrest among the natives", Lt. Drake is undercover as a beachcomber in a small island of the Hawaiian group. 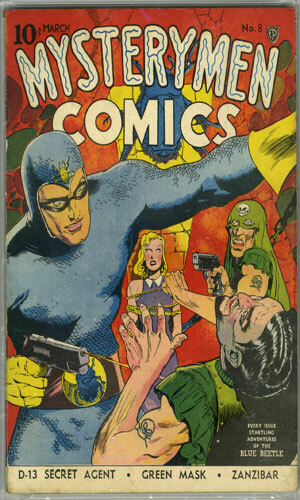 From Mystery Men Comics #9 - A sabotage gang prepares to blow up a ship in a port but Lt. Drake has a sharp eye and spots the activity. 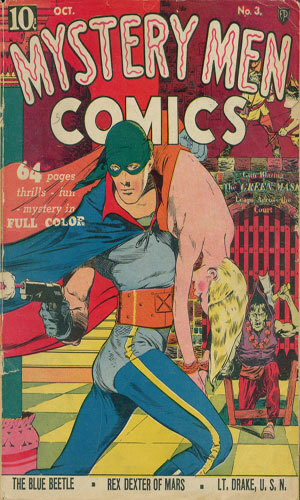 From Mystery Men Comics #10 - A huge gambling ship anchored off the coast of California might hold a clue to a new gang of smugglers flooding the country with narcotics. 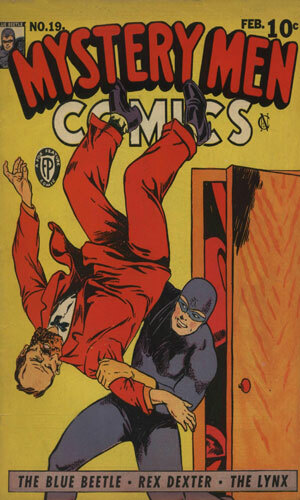 From Mystery Men Comics #11 - Big-time crime czars are escaping the police by fleeing the country. It is Lt. Drake's job to find out how. 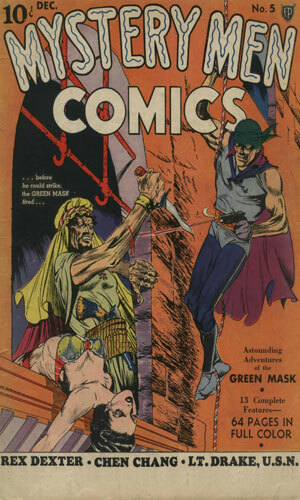 From Mystery Men Comics #12 - A wave of smuggling of Orientals into America has raised alarm. Lt. Drake is assigned to the case and learns the men are smuggled in inside large fish. 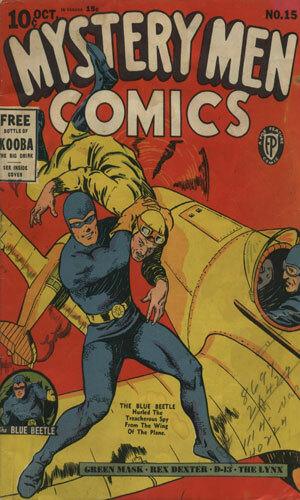 From Mystery Men Comics #13 - A new aircraft that can fly 500 mph is being sought by spies. The creator has destroyed the plans so only he knows its secrets so now the spies want him. 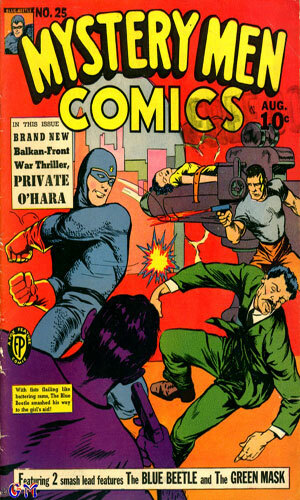 From Mystery Men Comics #14 - Lt. Drake must stop foreign spies from smuggling out stolen aircraft plans onboard a small freighter. Beating up the captain seems the best way to get hired. 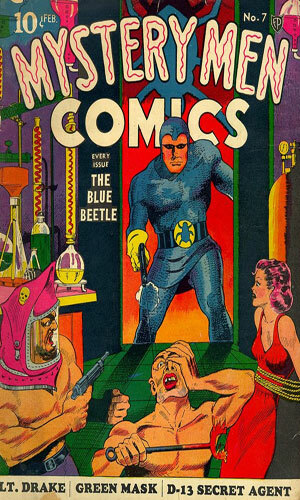 From Mystery Men Comics #15 - A strange character called The Skull is ready to steal the US Navy's newest torpedo boat and take it to a foreign power using his electron-ray gun. From Mystery Men Comics #16 - Foreign agents are going after the US Navy's new 28 inch gun by kidnapping the designer's daughter. Lt. Drake is standing by to stop them. 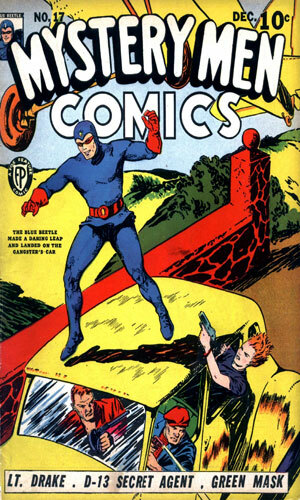 From Mystery Men Comics #17 - Spies are smuggled into the area of a canal and are preparing to destroy it. 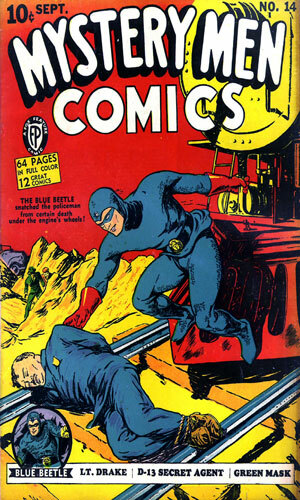 From Mystery Men Comics #19 - Gangsters are hired to steal and smuggle out vital machine parts used in making US Navy armaments. The foreign agent hiring them is determined to find who is leaking his activities. His actions earn the enmity of a resourceful woman calling herself Miss X. 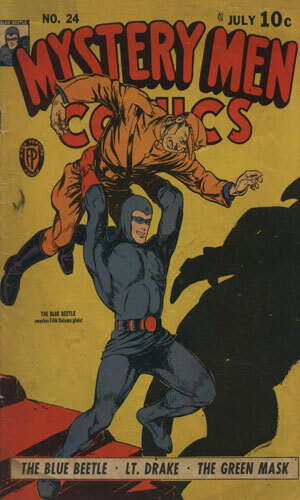 From Mystery Men Comics #20 - Lt. Drake is captured while trying to stop saboteurs out to destroy a US arsenal. He would have been blown to bits without the help of the woman known as Miss X. From Mystery Men Comics #21 - Two incredibly insane but apparently brilliant scientists join forces to destroy parts of America to take over it and then the world. Lt. Drake is off to find out who is behind them but Miss X is there first and needs saving for a change. From Mystery Men Comics #22 - Apparently Soviet spies are out to steal British bomb technology but Lt. Drake in on load to the UK to protect it. They kidnap him and substitute a look-alike. 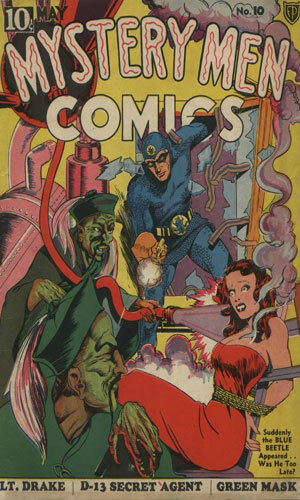 From Mystery Men Comics #23 - A group of spies lead by Frau Izan is causing a lot of trouble. Lt. Drake is out to stop them but she is very elusive. She gets more so when a secret serum shrinks her to a couple of inches (including her clothes) to steal the plans of a new bomb sight. 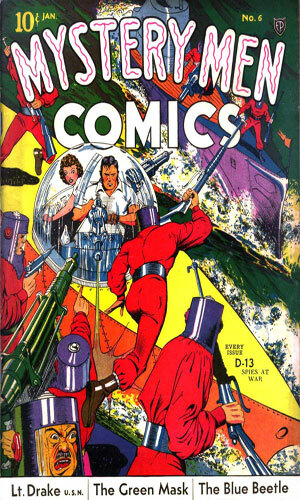 From Mystery Men Comics #24 - Foreign agents are determined to destroy all the factories making all the parts to build the torpedo boats attacking U-Boats. Lt. Drake steps in to stop them when he see a two-man tank heading down Pennsylvania Avenue at night and suspects something amiss. 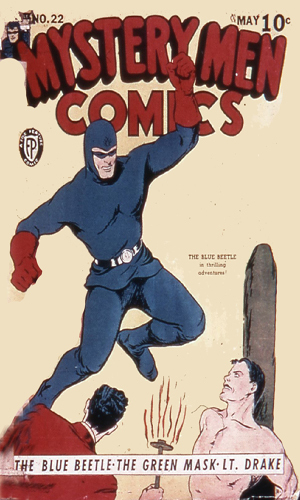 From Mystery Men Comics #25 - A Nazi spy master is determined to eliminate all agents sent to stop him in his sinister work. Lt. Drake is the next guy up and the spy master uses the beautiful Kate to kidnap him. She has a change of heart. I do not give the Lt. Drake stories a very good grade because they simply do not deserve any better. The villains are good at being bad which is always important but Drake is pretty lousy at being the hero. He wins the day each time but sometimes it is more luck than skill. He is apparently a firm believer in "better to be lucky than good". This is not to say he is bad per se. He just rashly barges in, often paying for it, and damn the consequences. Even more responsible for the poor score, though, is the fact that the stories have no spark. You do not get to know Drake therefore you do not get to care for what happens to him. He arrives at the scene, kicks some rear, gets a few kicks himself, suddenly wins and the story ends. Not that there is much more that might be done in the 5 pages his tales are usually afforded but a panel or two showing something about him might have made him more interesting.